Having a dog with allergies can be frustrating for you and your dog. Where do you start trying to figure out what your dog is intolerant to? The easiest way to find what food or environmental items are causing your dog problems, is using an at home dog allergy test. The Pet Intolerance Test is affordable allergy testing that tests for over 300 sensitivities in food and the environment. Scratching can be a sign of your dog having an intolerance. The Pet Intolerance Test will test 10 to 15 strands of hair from your dog. There is no blood work and no needle pricks with this testing. It is a non-invasive test using the latest technology that will test the DNA found in your pet’s hair. Testing will include all major proteins, most grains, fruits, vegetables and the most common trees and grasses that could be causing your dog problems. 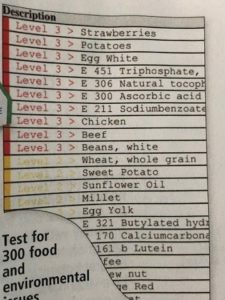 They are testing over 300 of the most common food and environmental items. The test scans your dog’s hair sample using bio resonance technology, which is state of art technology. Hair testing is not affected by factors such as recent meals, stress or medications. It is more affordable, allowing testing on more items than other tests. Simply comb or brush your dog, and the hair that you collect is sent into Affordable Testing. They will analyze the hair and get a detailed report back to you within 7 to 10 business days after they receive the sample via an email. The great thing about intolerance testing is that you don’t have to actually ingest or be exposed to the item for it to register as an imbalance. This means you will be aware of items that could cause your dog problems without them ever being exposed to them and help you by being able to keep these items away from your dog. You can purchase the Pet Intolerance Kit here. Cost of kit and testing is under $150. This at home test is a test for intolerance. It only tests for non-IgE (immunoglobulin E). Having an intolerance can cause reactions from as mild as a skin rash to severe digestive issues. They are normally not life threatening. A true allergy is often life threatening. It is caused by the body mistaking a food or item as harmful and releasing antibodies to fight whatever the item is. Allergies, which are caused by the body’s immune system are much more serious. These type of reactions occur within minutes of ingestion or exposure and are diagnosed through a blood test or skin prick test done by your veterinarian or allergy specialist. If you think your dog is having an allergic reaction to something, you should contact your veterinarian immediately. You will receive a very detailed report that will be color coded. There will be items that are red, yellow, and green. Needless to say, the items in red are the most serious and need to be removed immediately. There will be instructions included with your report that will explain how to handle the information that you receive, but I will briefly explain the process to follow once you receive your results. Go through the items on the list and check off all that your dog is subjected to. Could be food or plants. The red items you will want to address first, since these items will cause your dog the most problems. Remove all red items from your dog for 3 to 5 weeks and then reintroduce them one at a time. This will help you realize if it is something that is affecting your dog. Keep in mind that intolerance reactions are not immediate and can take 24 to 72 hours to show up. You will then continue working your way through the list and adjusting your dog’s diet if necessary to help eliminate the issue that was originally causing your dog problems. It is very possible that you will have to change your dog’s food. 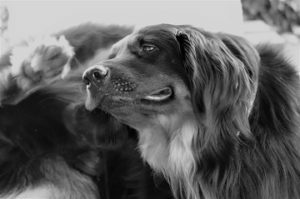 If your dog is biting or chewing their paws, scratching, rubbing their faces, vomiting often, or get frequent ear infections, your dog probably has some type of intolerance. Food intolerances are the most common intolerance that your dog will have, but there are many environmental items that could cause an intolerance they could experience. I had a dog with so many intolerances that I took him to a specialist and had his skin pricked. (This cost me more than $600) One of his intolerances was dead flies. A food intolerance is a gradual reaction over time from eating the same food or food with the same ingredients. Eventually their body will start having affects from the intolerance. Common food intolerances for dogs are corn, wheat, beef, chicken, lamb, pork, rabbit, fish, dairy, egg and soy. Most of the common dog foods that you purchase with have several of these ingredients listed. You need to figure out which are causing your dog issues, and eliminate it from your dog’s diet. That is where intolerance testing can help you, by identifying the items that will cause your dog problems. Take a look at Duke below. He can make you smile. If your dog has chewed the fur off his feet, rubbing his face on everything he can find, or getting repeated ear infections, your dog most likely has some intolerance to either food or his environment. An at home dog allergy test can help you pinpoint what exactly is causing your dog to suffer. The Pet Intolerance Test only requires 10-15 strands of your dogs hair and you will receive detailed results within 7 to 10 days. This test is truly affordable allergy testing to finally get your dog feeling better. It is much less expensive that taking your dog to an allergy specialist. The Affordable Testing also offers testing for cats, horses and humans. The human test is just slightly more expensive, as they test for over 750 items. If you have any questions or comments, please leave them below. You can follow justforyourdog.com on Pinterest, FaceBook and Twitter. Thanks for reading Abioye and I am glad that you found the information benefical. This is great post and educative considering I just read about dogs intolerance for the first time, funny right. I once had a dog which I think planned to train but it went astray and I never saw it again. I had to replace it with an already trained dog and that’s so expensive, guess what, I lost the dog too. Now am beginning to think those dogs intolerance is actually myself. Well, if you get another dog I hope you are able to hang onto that dog. Good luck with your next dog. This is my very first time of getting to know of such technology. I never knew that a dog’s hair could be tested. The latest technology is really powerful and instead of stressing to use needle to get blood from the dog u could simply use comb to come the hair playfully and just collect the hair for samples. But I need to know,,, when the hair samples is sent through email, how could the test be carried out when the hair samples is not physically sent. Thanks for reading Kenechi. You actually have to send the hair samples in the mail for them to test. They include in the kit packaging for the hair sample. After they receive the sent sample, they will get the results back to you via email within 5-7 business days. This is very revealing and educating. The advantage this intolerance test offers is that you can now prevent instead for solutions for cure. Dogs can now lead a life free of infirmity by this great technology that requires just a piece of hair for analysis. The affordability of this technology will also encourage pet lovers to patronise it.Thanks for sharing. Thanks for reading my article Chris. This is definitely an affordable option to get ahead of the game with dog intolerances. It is surprising how many dogs have issues with food. Hopefully this test will help more pet owners learn what is or could be causing problems for their dogs.